We are getting down to the last minute for craft fairs and gifts. Today is the craft fair here at work. 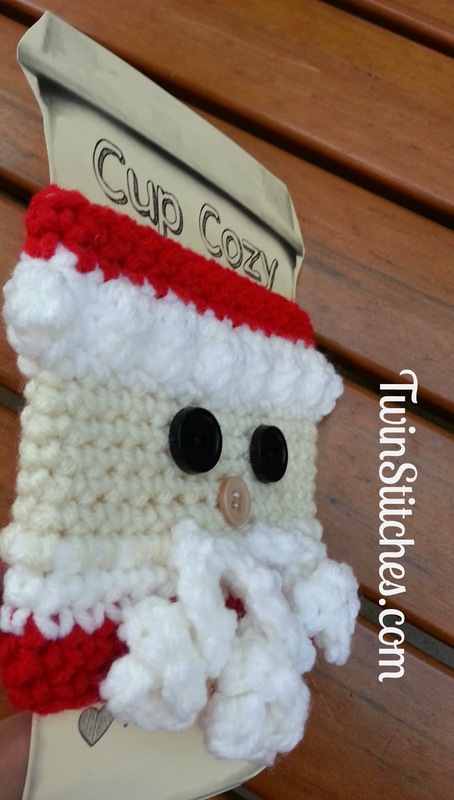 My friend and I have crocheted about thirty cup cozies with the thought that they are simple gifts with a lot of personality. In our fever to make them all, I found myself swamped with IDEAS and one stood out from the bunch. 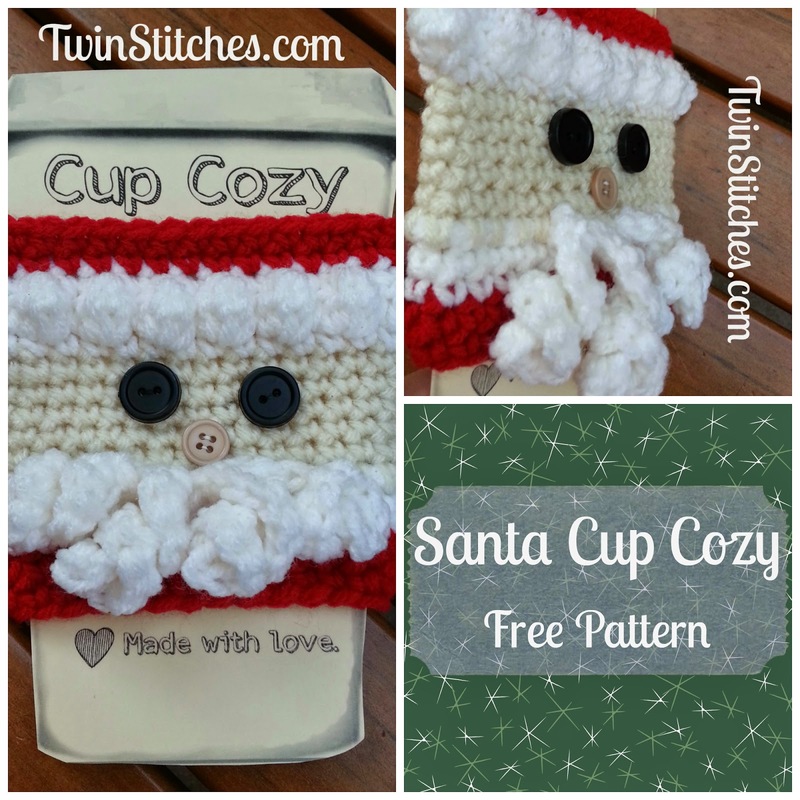 Meet the Santa Cup Cozy! I knew I wanted to make something Santa-ish, but I could not fine the right pattern. Then, yesterday, I had a flash of inspiration. I'm sharing it with you because I love it so much! Worsted weight yarn in 3 colors; white, red, and a color for skin. I've used buff here. This pattern is worked in the round in rows. With red yarn, chain 29. Slip stitch to first chain to form a loop, being careful not to twist the chain. Chain 1. Row 1: Single crochet in each stitch around. Join to the top of the first SC. Chain 1. Row 2: Single crochet in each stitch around. Join to the top of the first SC. Fasten off. Row 3: Switching to white yarn join and chain 1. Single crochet in each stitch around. Join to the top of the first SC. Chain 1. Row 4: Single crochet in each of the next 12 stitches. *Slip stitch into the next stitch and chain 10. Working back along the chain, crochet 2 single crochets in each chain back to the initial slip stitch. Single crochet into the same stitch as the slip stitch. * Repeat from * to * three more times. Single crochet in each of the next 12 stitches. Join to the top of the first SC. Row 5: Single crochet in each stitch around. Join to the top of the first SC. Fasten off. Row 6: Switch to the flesh colored yarn, join, and chain 1. Single crochet in each stitch around. Join to the top of the first SC. Chain 1. Row 7-11: Single crochet in each stitch around. Join to the top of the first SC. Chain 1. At the end of row 11, Fasten off. Row 12: Switch to white yarn, join, and chain 1. Single crochet in each stitch around. Join to the top of the first SC. Chain 1. Row 13: Single crochet in the first stitch. Bobble Stitch in the next. *Single crochet in the next. Bobble Stitch in the next. * Repeat from * to * around. Join with a slip stitch to the top of the first single crochet. Row 14: Single crochet in each stitch around. Join to the top of the first SC. Fasten off. Row 15: Switch to the red yarn, join, and chain 1. Single crochet in each stitch around. Join to the top of the first SC. Chain 1. Row 16 Single crochet in each stitch around. Join to the top of the first SC. Fasten off. Sew your button for the nose in the flesh colored yarn. Attach the buttons for the eyes. I love the 3D effect of this cozy! P.S. 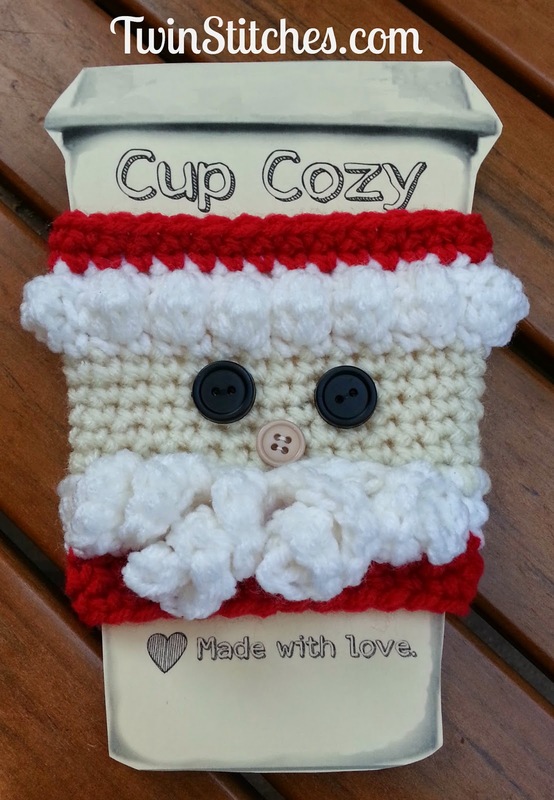 If you like the Cup Cozy insert, you can find it a the Frogging Along blog here.